This is a guest diary submitted by Brad Duncan. In September 2014 after the Neutrino exploit kit (EK) had disappeared for 6 months, it reappeared in a different form. It was first identified as Job314 or Alter EK before Kafeine revealed in November 2014 this traffic was a reboot of Neutrino . This Storm Center diary examines Neutrino EK traffic patterns since it first appeared in the Spring of 2013. 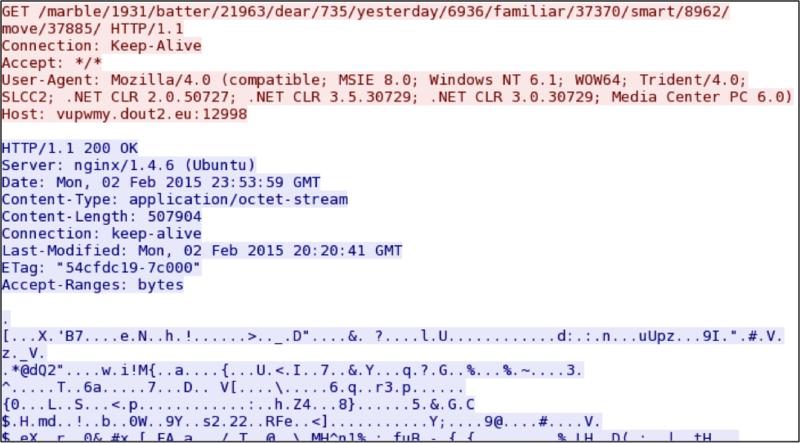 Neutrino was first reported in March 2013 by Kafeine on his Malware Don't need Coffee blog . It was also reported by other sources, like Trend Micro . Shown above: Neutrino EK traffic from April 2013. Shown above: Neutrino EK traffic from June 18th, 2013. In October 2013, Operation Windigo (an on-going operation that has compromised thousands of servers since 2011) switched from using the Blackhole EK to Neutrino . Shown above: Neutrino EK traffic from February 2nd, 2014. Shown above: Neutrino EK traffic from March 8th, 2014. March 2014 saw some reports about the EK's author selling Neutrino . Later that month, Neutrino disappeared. We stopped seeing any sort of traffic or alerts on this EK. Shown above: Neutrino EK traffic from November 29th, 2014. Traffic patterns have remained relatively consistent since Neutrino reappeared. I infected a VM on February 2nd, 2015 using this EK. Below are the HTTP requests and responses to Neutrino EK on vupwmy.dout2.eu:12998. HTTP/1.1 200 OK (text/html) - No actual text, about 25 to 30 bytes of data, shows up as "Malformed Packet" in Wireshark. The malware payload sent by the EK is encrypted. Shown above: Neutrino EK sends the malware payload. 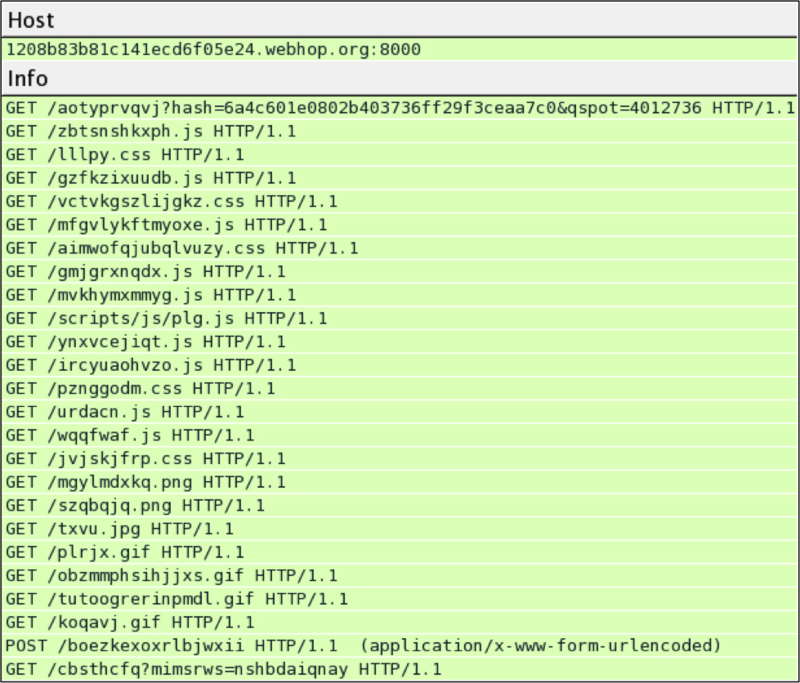 This malware is similar to previous Vawtrak samples I've seen from Neutrino and Nuclear EK last month  . Exploit kits tend to evolve over time. You might not realize how much the EK has changed until you look back through the traffic. Neutrino EK is no exception. It evolved since it first appeared in 2013, and it significantly changed after reappearing in December 2014. It will continue to evolve, and many of us will continue to track those changes.